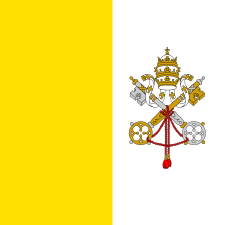 This article is about the Pope Liberius. For the praetorian prefect, see Liberius (praetorian prefect). Pope Liberius (died 24 September 366) was Pope from 17 May 352 to his death in 366. According to the Catalogus Liberianus, he was consecrated on 22 May as the successor of Pope Julius I. Liberius is mentioned in the The Greek Menology, the Eastern equivalent to the martyrologies of the Western Church. a measure of sainthood prior to the institution of the formal Western processes of canonization. He is recognized as a saint within the Eastern Orthodox Church. His first recorded act was, after a synod had been held at Rome, to write to Emperor Constantius II, then in quarters at Arles (353–354), asking that a council might be called at Aquileia with reference to the affairs of Athanasius of Alexandria, but his messenger Vincentius of Capua was compelled by the emperor at a conciliabulum held in Arles to subscribe against his will to a condemnation of the orthodox patriarch of Alexandria. At the end of an exile of more than two years in Thrace, after which it seems he may have temporarily relented to the Arian cause, or been set up to appear to have relented – partially evidenced by three letters, quite possibly forgeries, ascribed to Liberius, the emperor recalled him under extreme pressure from the Roman population who refused to recognize the puppet "pope" Felix. As the Roman See was "officially" occupied by Antipope Felix II, a year passed before Liberius was sent to Rome. It was the emperor's intention that Liberius should govern the Church jointly with Felix, but on the arrival of Liberius, Felix was expelled by the Roman people. Neither Liberius nor Felix took part in the Council of Rimini (359). After the death of the Emperor Constantius in 361, Liberius annulled the decrees of that assembly but, with the concurrence of bishops Athanasius and Hilary of Poitiers, retained the bishops who had signed and then withdrew their adherence. In 366, Liberius gave a favourable reception to a deputation of the Eastern episcopate, and admitted into his communion the more moderate of the old Arian party. He died on 24 September 366. Some historians have postulated that Liberius resigned the papacy in 365, in order to make sense of the reign of Antipope Felix II. That view is overwhelmingly outnumbered by the writings of historians and scholars which document Liberius' staunch orthodoxy through the end of his pontificate ended by his death. Pope Pius IX noted in Quartus Supra that Liberius was falsely accused by the Arians and he had refused to condemn Athanasius of Alexandria. In his encyclical Principi Apostolorum Petro, Pope Benedict XV noted that Pope Liberius went fearlessly into exile in defence of the orthodox faith. In the Eastern Orthodox Church, he is a saint whose feast is celebrated on August 27. The Basilica di Santa Maria Maggiore in Rome is sometimes referred to as the Liberian Basilica. 1 2 3 4 Herbermann, Charles, ed. (1913). 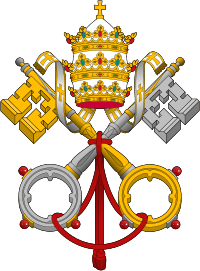 "Pope Liberius". Catholic Encyclopedia. New York: Robert Appleton Company. ↑ "St. Liberius the Pope of Rome". oca.org. Orthodox Church in America. Retrieved 2015-04-14. ↑ Herbermann, Charles, ed. (1913). "Abdication". Catholic Encyclopedia. New York: Robert Appleton Company. ↑ Pope Pius IX (6 January 1873). "Quartus Supra (On The Church In Armenia)". Eternal Word Television Network. Retrieved 2 June 2015. ↑ Pope Benedict XV (5 October 1920). "Principi Apostolorum Petro, Encyclical Of Pope Benedict XV On St. Ephrem The Syrian To The Patriarchs, Primates, Archbishops, Bishops, And Other Ordinaries In Peace And Communion With The Apostolic See.". Libreria Editrice Vaticana. Retrieved 2 June 2015. ↑ "On Monday, August 27, 2012 we celebrate". Online Chapel. Greek Orthodox Archdiocese of America. Retrieved August 14, 2012. This article incorporates text from a publication now in the public domain: Chisholm, Hugh, ed. (1911). "Liberius". Encyclopædia Britannica. 16 (11th ed.). Cambridge University Press. Wikimedia Commons has media related to Liberius. 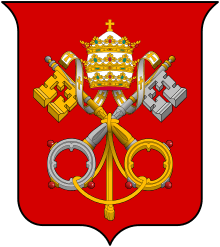 Wikisource has the text of the 1913 Catholic Encyclopedia article Pope Liberius. Theodoret of Cyrus' record of his confrontation with the Emperor over Athanasius from his Ecclesiastical History.